I promised another book review, so here it is! 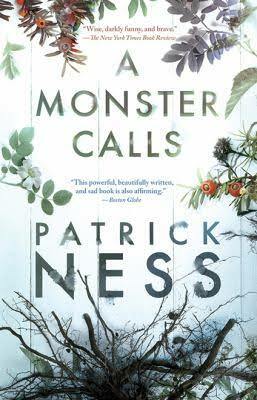 Inspired by the ideas of Siobhan Dowd, Patrick Ness brings her story to life in the book A Monster Calls. When I picked up this book in a little bookstore in Chicago, little did I know how much significance it would have in my life. I had no idea how much it would relate to me and how many lessons I would take from it. Seemingly meant to be a book meant for youth, 19 year old Rebecca took this book to heart. It is a book of loss, personal growth, and of letting go… to name a few things without giving away too many spoilers. This book was a journey from start to finish. I devoured it in the span of three days, barely putting it down. I had never expected it to take such a hold on me. Honestly, I have no idea why I picked it up when I did. At the time, my life was spiraling out of control. My grandmother had recently passed away from cancer and I was consumed by my grief. That was when I met Cernunnos. He is also known as the Green Man, or Herne the Hunter; for you English folks out there. The mythology about him was fascinating, even though there is little known and written about him. I kept finding little hints of him everywhere I went. Then I decided to pick up this book and sit down with it. My jaw dropped when I realized that the “monster” was the god I had been researching. In this book, the “monster” comes to Conor in the form of a giant oak tree. He arrives in order to teach him lessons that were not only valuable to the young boy, but for me. He teaches him to face his fears and be able to let go of what he cannot control. Through this book, I felt like the monster was teaching me lessons as well. That I had to let go of my sadness, because I could not control what had happened in the past. To say that my story and Conor’s story are similar is a bit of an understatement, but once again… spoilers. This is a book that I would recommend everyone to read. Everyone is going to take something different from it. It is a wonderful story and it is so beautifully written. This book receives only the highest praise from me and hopefully you can gather why.